Eyesat 1 is an experimental communications microsatellite with an store-dump payload built by Interferometrics Inc. of Chantilly, Virginia. The mission of Eyesat 1 was experimental monitoring of mobile industrial equipment. Eyesat 1 has provided the National Oceanic and Atmospheric Administration (NOAA) with communication services to the South Pole. Additionally, the satellite carried an FM Repeater for AMRAD, a technically oriented, non-profit organization of radio amateurs based in the Virginia suburbs of Washington, D.C., to meet the needs of amateurs for a platform to conduct digital satellite communications experiments. The amateur payload was called AMRAD OSCAR or OSCAR 27. 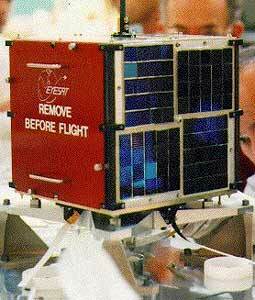 The satellite was based on the AMSAT-NA Microsat platform. Power was supplied by body mounted solar cells, charging the spacecraft's batteries. Because of the satellite's limited power budget and a desire to maintain sufficient battery capacity for as many years as possible, the amateur transmitter on AO-27 is on for only part of the daylight portion of each orbit. A constellation of six Eyesat satellites was originally planned, but only the prototype was launched. An engineering model of the Eyesat 1 is currently on display at the Smithsonian Institution’s Air and Space Museum.